Zermatt continues to draw the crowds. 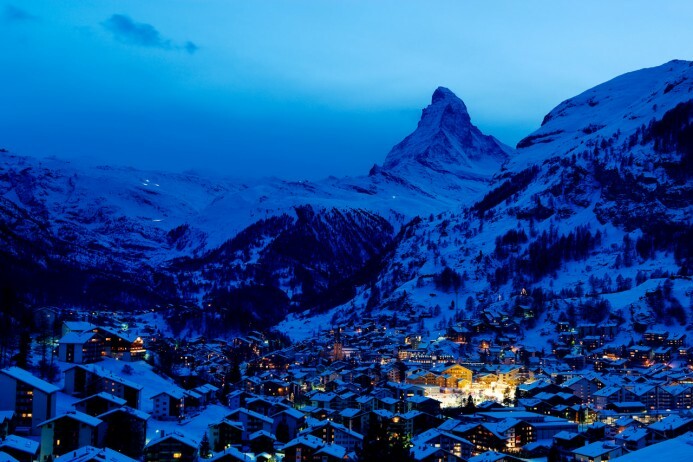 If you’re in search of a destination out of the ordinary, a Zermatt ski vacation is sure to deliver. The first thing you’ll notice when arriving in Zermatt is a remarkable, and probably welcomed, lack of noise. Since 1891, the local doctor is the only person allowed to have a car in Zermatt. So you, and everyone else, will be traveling by train, which is a highly enjoyable experience. The only in-town transportation is by horse-drawn sleighs or electro-taxis and ski buses. Fortunately, Zermatt is a destination resort; that is, the village is difficult enough for weekend skiers to reach to keep most of them away, and the vast terrain – more than 188 miles of marked ski trails (including Breuil-Cervinia) and a resort lift capacity of nearly 92,000 people per hour – easily absorb any crowds. Even during the busiest holiday season, lift lines are not impossibly long and un-crowded slopes are there for the taking. Mile-high Zermatt—an idyllic mountain village at the foot of Switzerland’s iconic Matterhorn peak—has developed into one of the world’s most famous ski resorts. Favoured by its southern exposure, sheltered by the wind and generously endowed with snow, a Zermatt ski vacation offers some of the most spectacular skiing in the Alps. Vacationers looking for off-piste activities will be delighted to know that Zermatt has sledding, curling, ice climbing, snowshoeing, winter hiking. Evening adventurers things liven up; there are plenty of nightlife options in Zermatt’s 50 bars. The closest airport for ease of access to Zermatt is Sion at 30 miles away. A 6 seat Cessna Citation CJ2 jet from London to Sion is approximately 1 hour 20 minutes. A larger 8 seat Cessna Citation XLS will complete the journey in 1 hour 15 minutes. The Drive time will take approximately 1 hour 20 minutes due to the mountain roads. A helicopter will get you there in 35 minutes. Arranging a private jet charter or helicopter transfer with Freedom Air to arrive in style to Zermatt is simple. The Freedom Air team can be reached on +44 (0) 1275 548001 to book your next trip.